Participation in the National exhibition of Bulgaria in Sofia city. 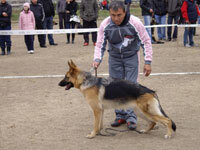 In class 9-12 months the female dog Tigra von Goppy I.
Valuation - very good, 2nd place. 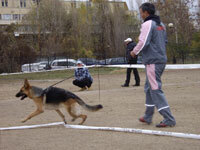 In class 12-18 months the female dog Nadia von Goppy I. In class over 24 months the male dog Boomer vom Messebau. Valuation - excellent, 1st place.